Local TD, Denis Naughten, has confirmed that the Centre Parcs holiday resort in Ballymahon, due to open this summer, was connected to the national gas network prior to the Christmas period, describing it as “another significant milestone in the development of tourism as part of Ireland’s Hidden Heartlands”. During his time as Energy Minister Denis Naughten was instrumental in securing the construction of the gas pipeline from Athlone to Ballymahon, which also has the potential to bring natural gas to many towns in the West and North West of Ireland. “Centre Parcs is a major tourism operator and its resort in Ballymahon, will see over 100,000 visitors come to the region annually. This is equivalent to the number of tourists that visit Killarney, Co. Kerry, each year. “The development of the Ireland’s Hidden Heartlands tourism brand, which is about to be promoted internationally, is key to ensuring that counties Westmeath, Roscommon, Galway and Longford benefit from this project. 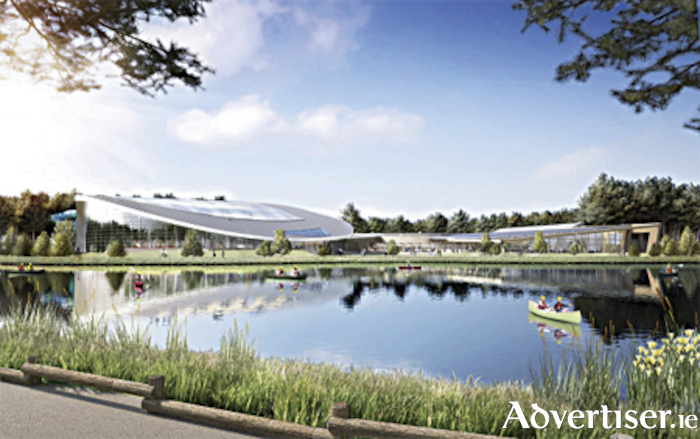 The Centre Parcs resort has huge potential to bring tens of thousands of tourists to all parts of the Hidden Heartlands region. Minster Naughten further commented on the tourism growth potential for the region. “The establishment of a national wetlands park on the Mount Dillon cutaway bogs from Sliabh Ban to the River Shannon and into County Longford will also help to drive long term tourism growth in the region. It will provide us with the opportunity to replace jobs that will go over the next decade on Bord na Mona bogs due to the reduction in the milling of peat for Lanesboro power station. “Presently, Bord na Mona is in the process of pulling out of peat extraction on 18,000 hectares of bogland just north of Lough Ree in both counties Roscommon and Longford. Opening up this land as a wetland park would not only be a major international draw for both eco and recreational tourism, but would also have an added benefit of being able to extend the flood plain of the River Shannon during the winter period to provide enhanced water storage between Lough Allen and Lough Ree, thereby alleviating the extent of flooding on the River Shannon,” the Minister concluded. Radar Center Parcs Ireland Hospitality_Recreation Minister Christmas Environment River Shannon Denis Naughten Minster Bord Na Mona Natural gas AN/FPQ-16 PARCS Les Hauts de Bruyres gas network Centre Parcs Socit des tablissements de plein air du Qubec tourism operator Lanesboro power station Mount Dillon Energy Minister gas pipeline Killarney Co.